I don't know how many people got an email like the one shown below in the last couple of days. There are a couple of things that come to mind when I see 'offers' like this. During the 2008/2009 property crash, someone ended up in possession of vast tracts of real estate. These 'someone's' included banks, hedge funds, and real estate speculators, some of whom had experience running back to the 1960's. Those with this experience published books, one round of which circulated in the 1970's/1980's - 'Nothing Down'. There's been a lot more hype recently about 'making money in real estate'. The people buying these ads most likely own the real estate you're supposed to make money off of. While you may or may not benefit from a speculative frenzy, all they have to do is sell at current market prices to gain from 50% to 75% over their respective purchases ten years ago. There are a lot of actors that need to 'close out a trade'. If the smart people aren't buying, then it's necessary to recruit a batch of newbies. While the people providing the service described in the attached screen shot may be perfectly legitimate, their sources are invariably protecting their respective interests. There's two dimensions to the interests of these sources, those of their employers, including sovereign states, and their personal private bets. As had been noticed in 'the big short', sometimes companies would talk up securities that they were shorting on their own account. Needless to say, this website has to pay for itself somehow. As is pointed out elsewhere, if you aren't the customer than you are the product. Those of us who use the site for free are often feeding information to actors that we know nothing about.These actors don't necessarily need to know what oil markets are doing, they are simply interested in public perceptions. Often this is to collect feedback on information being distributed via other channels. 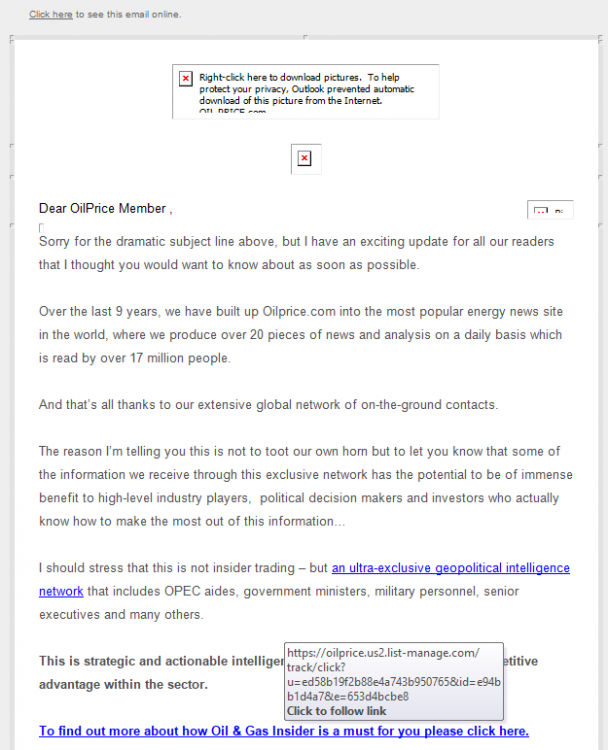 Oil and Gas Insider is an e-newsletter. It is apparently on subscription (I am not a subscriber) and is operated by Oilprice.com. On its face, it would be totally legitimate; you pay a subscription fee, and you get the newsletter by email.